The essays in this book demonstrate the breadth and vitality of American intellectual history. Their core theme is the diversity of both American intellectual life and of the frameworks that we must use to make sense of that diversity. 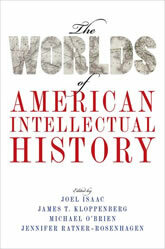 The Worlds of American Intellectual History has at its heart studies of American thinkers. Yet it follows these thinkers and their ideas as they have crossed national, institutional, and intellectual boundaries. The volume explores ways in which American ideas have circulated in different cultures. It also examines the multiple sites–from social movements, museums, and courtrooms to popular and scholarly books and periodicals–in which people have articulated and deployed ideas within and beyond the borders of the United States. At these cultural frontiers, the authors demonstrate, multiple interactions have occurred – some friendly and mutually enriching, others laden with tension, misunderstandings, and conflict. The same holds for other kinds of borders, such as those within and between scholarly disciplines, or between American history and the histories of other cultures.